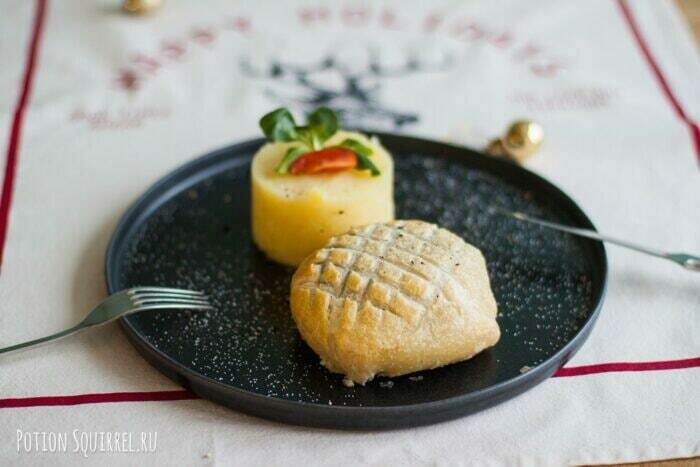 One of those dishes that not only look perfect on a festive table, but also impress guests with taste. I have long been eyeing the recipe for beef Wellington. The dish is not elementary. 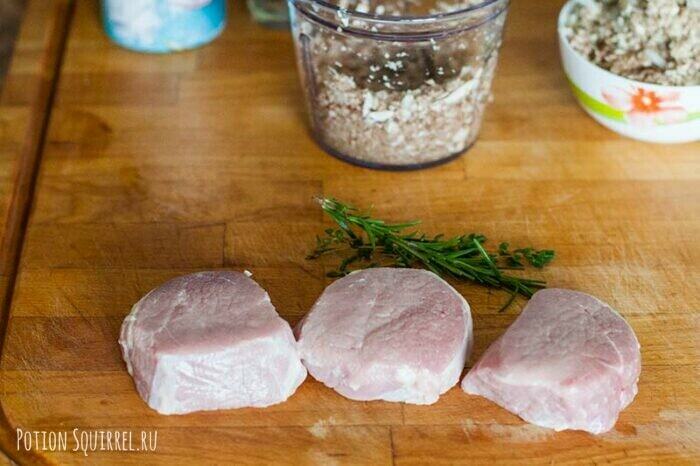 It is necessary to strictly follow the instructions, temperature and cooking time. But the result ... he is beyond praise. 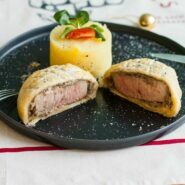 Juicy fragrant beef fillet (or veal) in an envelope of puff pastry with mushroom paste. 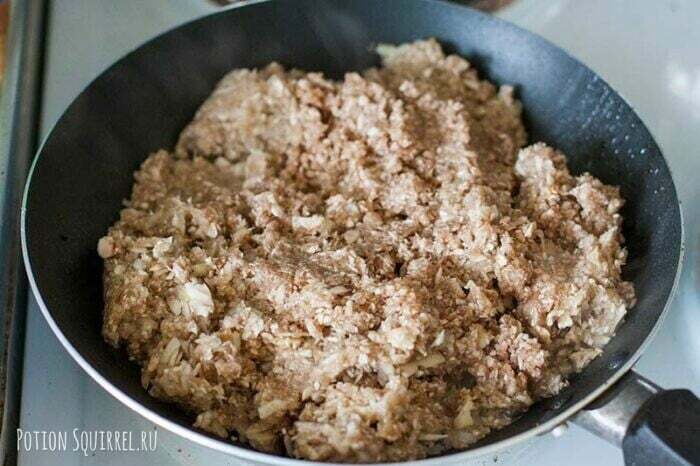 This is not a dish that you will cook often. But for the New Year or Christmas table it is perfect. 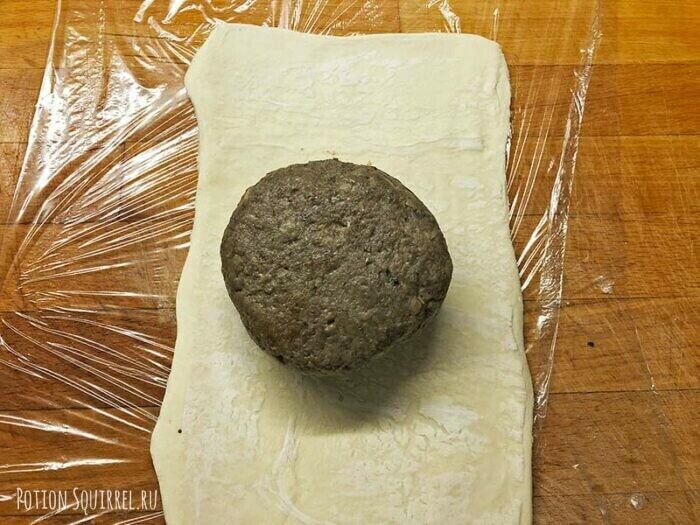 In the UK, the recipe for beef in a puff pastry envelope was popular in the 18 century. 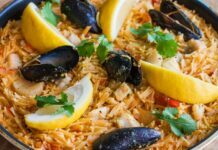 On the origin of the name of the dish goes a lot of speculation. At least directly it has nothing to do with the famous English Duke Wellington. 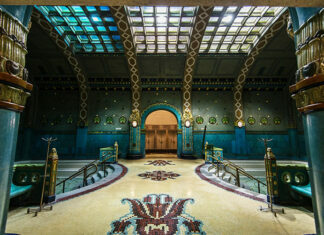 It was not his favorite, he was not invented by the ducal cook. 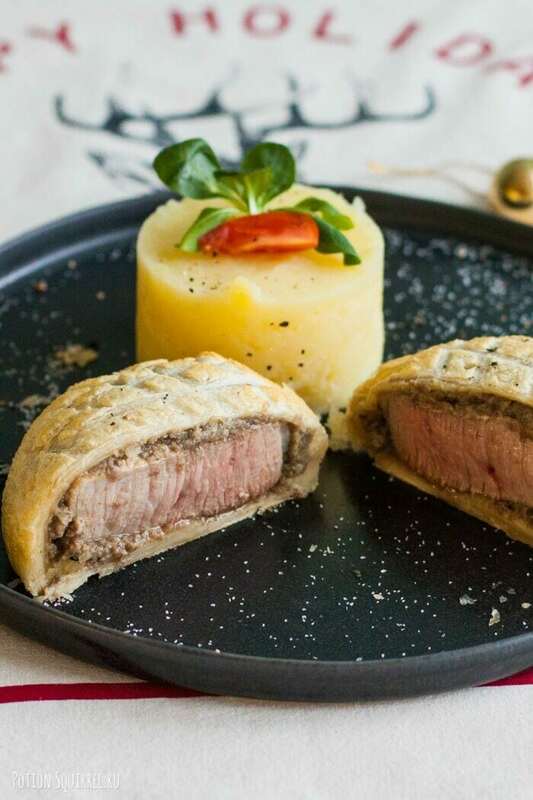 It is believed that the name “Wellington” received a recipe after the victory of the Allied armies of Great Britain, Prussia, the Netherlands and other states over Napoleon at Waterloo. The British army, under the command of the Duke of Wellington, was the first to take on the battle with the French. She suffered the most serious losses, waiting for the reinforcements of the Allies. The defeat of Napoleon became a reason for pride among the British. 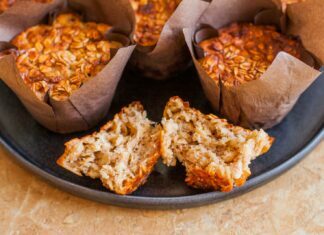 On this wave, the popular recipe at that time began to be called after the name of the one who brought the country victory over the sworn enemy. The theory is good, but I haven’t found confirmation in the cookbooks of that time. 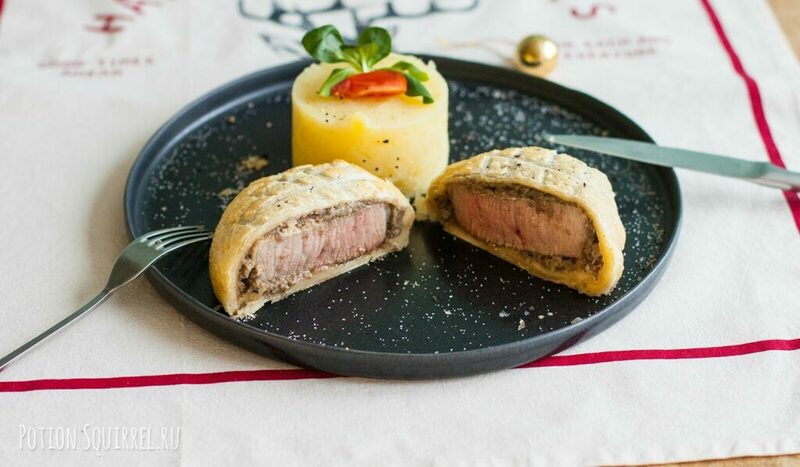 The first mentions of “beef Wellington” appeared in 1939, in New York food guide. But only in the 60 years of the 20 century did the very same recipe that we will be cooking today appeared. 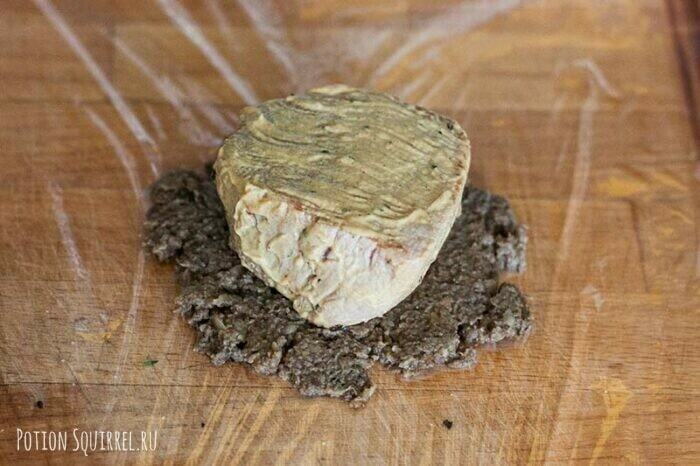 Tips on how to facilitate the cooking process, I peeped at Chef Gordon Ramsay. 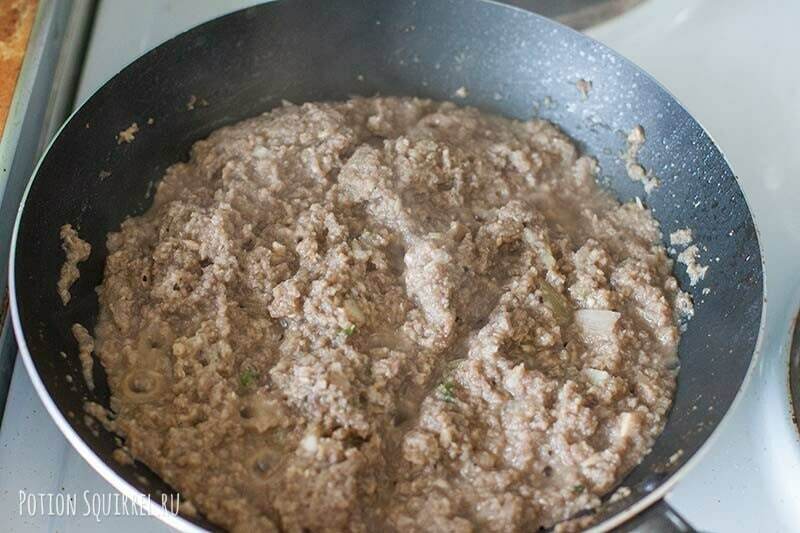 There are two ways to cook Wellington beef: per company and per batch. For the first take a big piece of beef tenderloin. 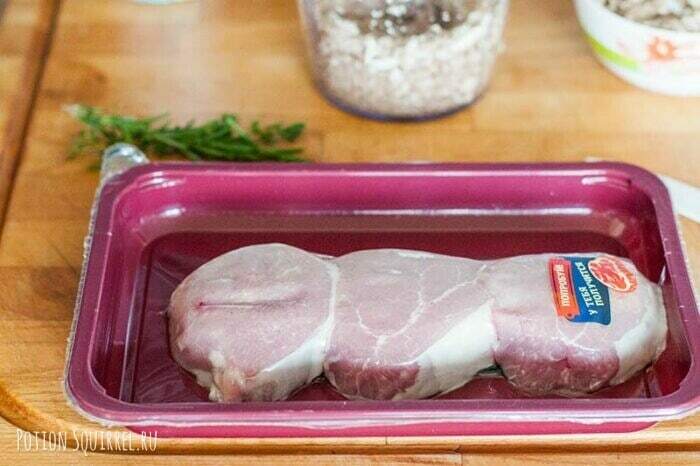 For the second, beef or veal fillets are used. The mechanism is simple. 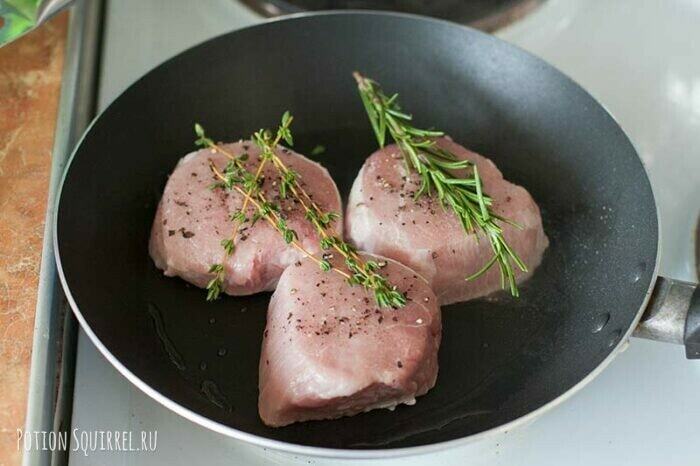 A piece of fillet is quickly fried on all sides in a frying pan to a crust to seal the juices inside. Meat is allowed to cool. 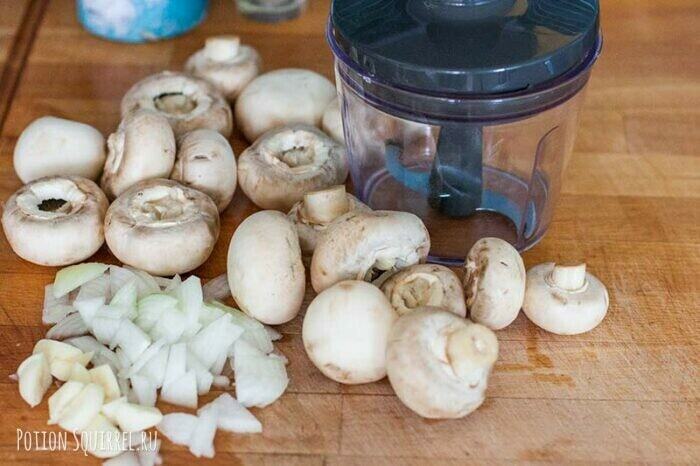 At this time, prepare the dyuksel - a paste of champignons, onions and garlic, seasoned with thyme and black pepper. 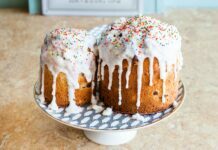 You can add wine or cream to the duxel. 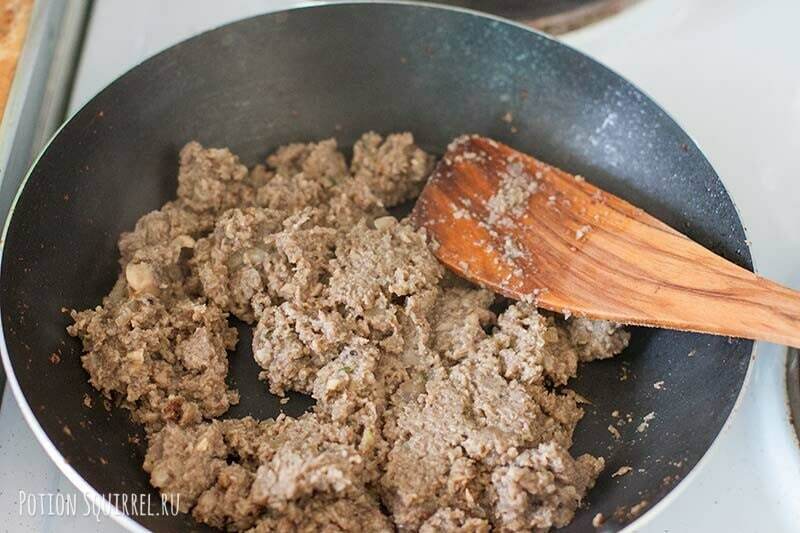 A piece of cooled meat is coated with a choice of pate or mustard, carefully put the mushroom paste on top, sometimes covered with bacon slices. 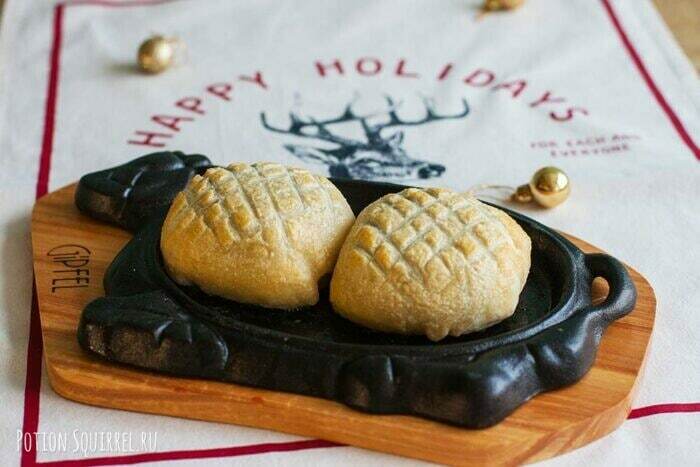 Together they are wrapped in thinly rolled puff pastry. From above, one smears an egg and makes a drawing with a knife a “shirt”. Baking time and temperature conditions in the oven must be observed accurately. 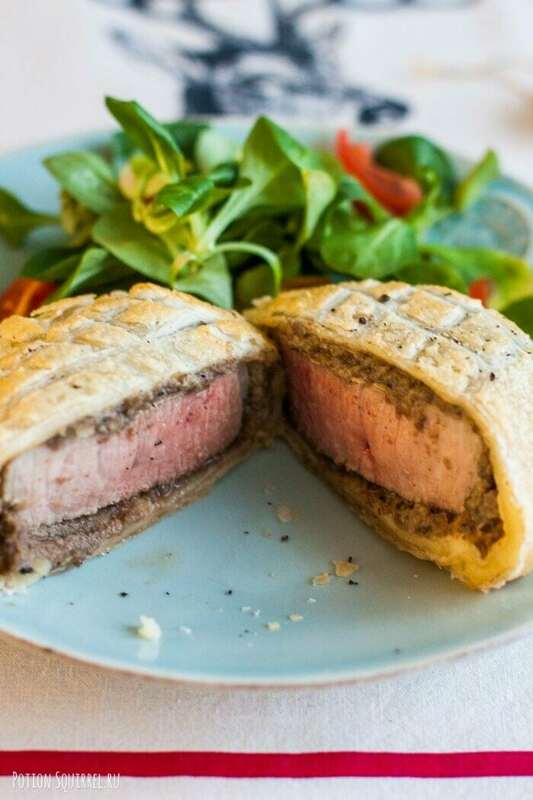 The finished beef Wellington is hidden in a crispy envelope, and inside is juicy tender meat with a magnificent layer of mushroom paste. Chef Gordon Ramsay often chooses this particular dish for cooks because of the level of difficulty. But do not worry! 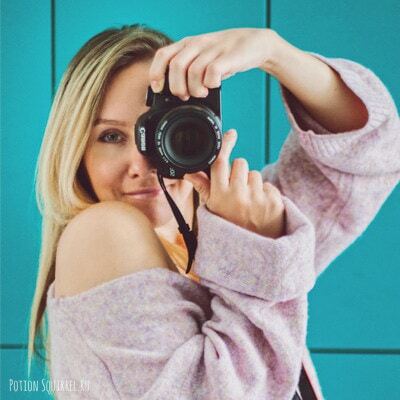 Follow the recommendations, and you will succeed. And some salt and pepper on top. 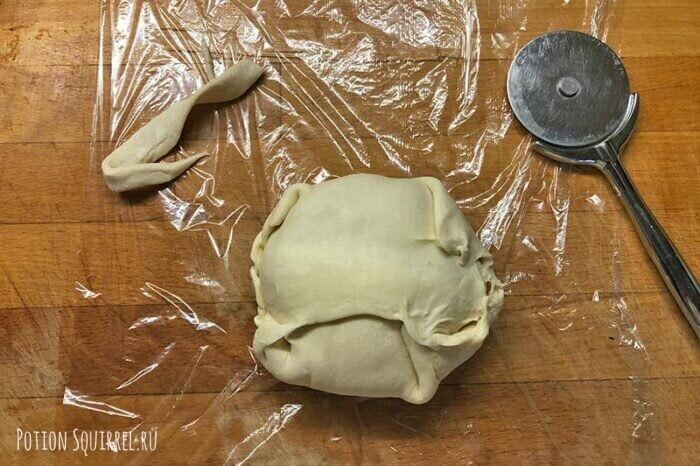 The recipe will be for a portion of beef Wellington. So its nicer to serve on the festive table! 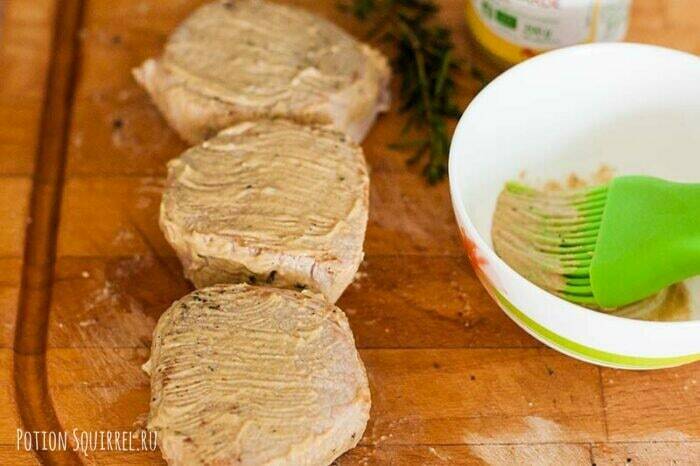 Beef (or veal, I managed to buy excellent pink veal medallions, I use them), first get out of the fridge and leave on the table so that it reaches room temperature. 40-60 minutes are usually enough. 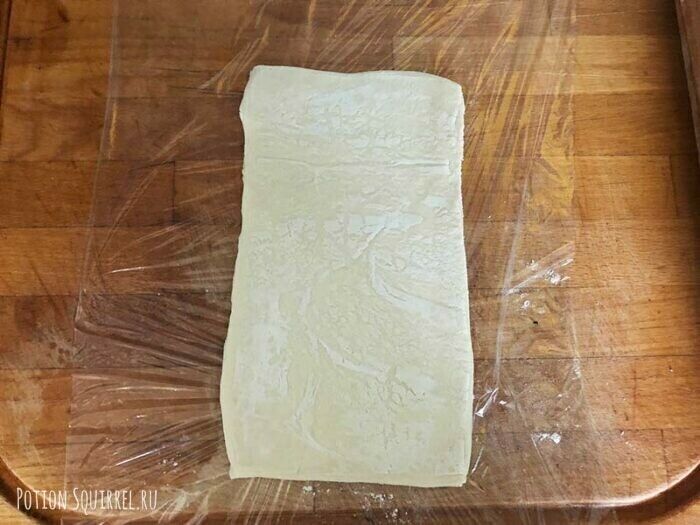 Remove puff pastry from the freezer, let it defrost. 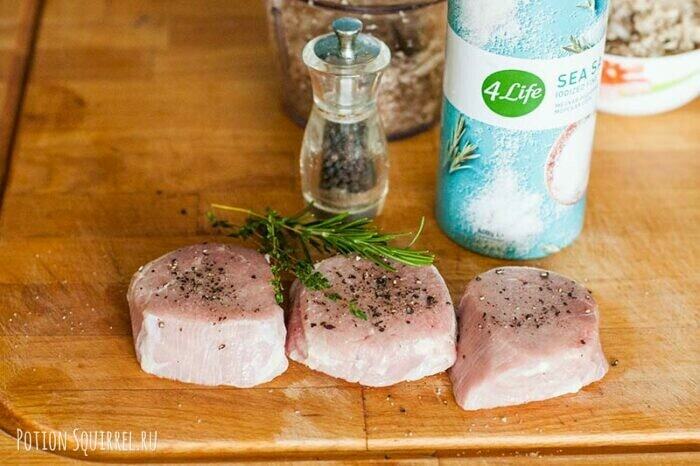 When the meat warms up, remove from the package, rinse with clean cold water and dry with napkins. 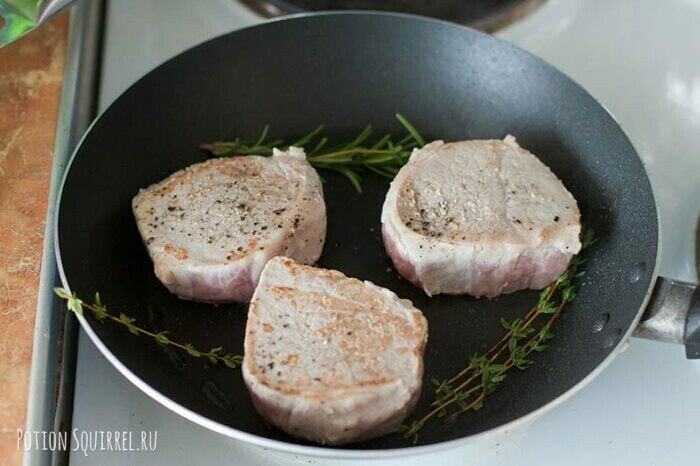 Throw meat pieces with rosemary and thyme in the pan. 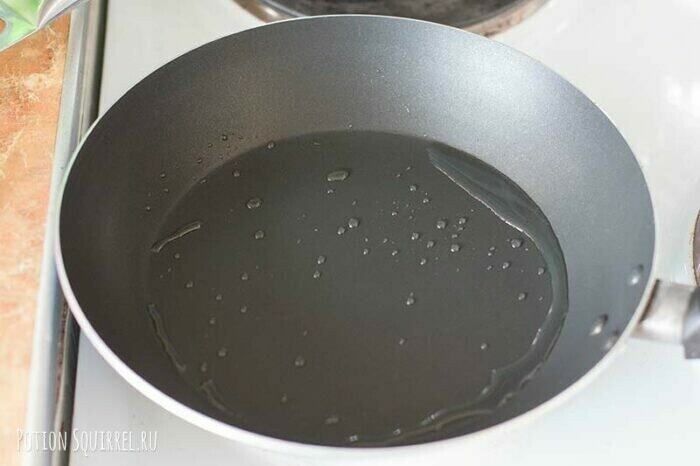 Quickly fry from all sides to seal the juice. All should take no more than a minute. Meat fry from all sides. Be sure to seal the edges too! Moisture starts to stand out almost immediately. 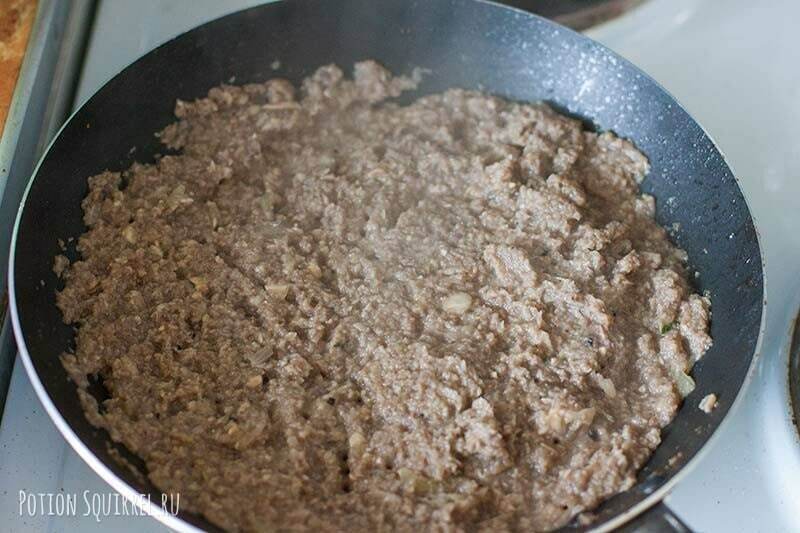 Gradually the mass will begin to thicken. An intense mushroom flavor appears with hints of thyme and black pepper. 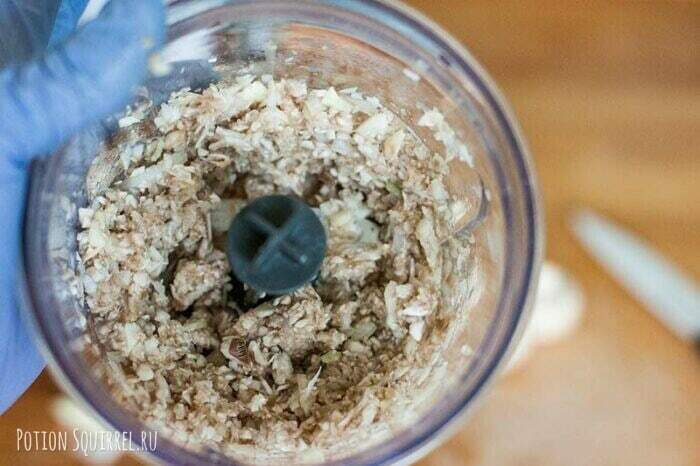 There is almost no moisture, thick mushroom paste remains, it is duxel. 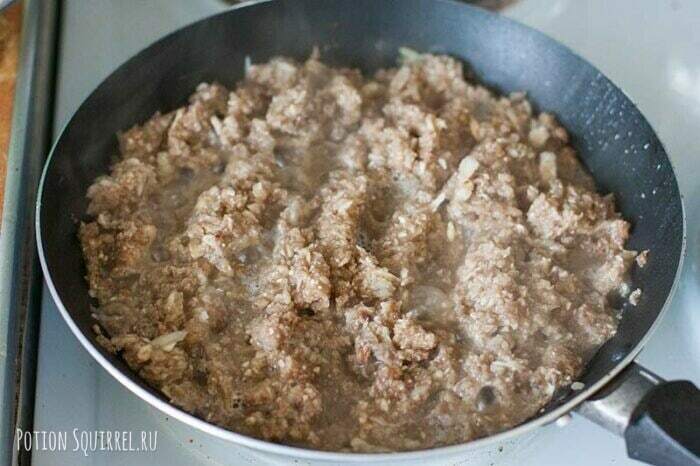 Lay a piece of meat in the center over the duxel. 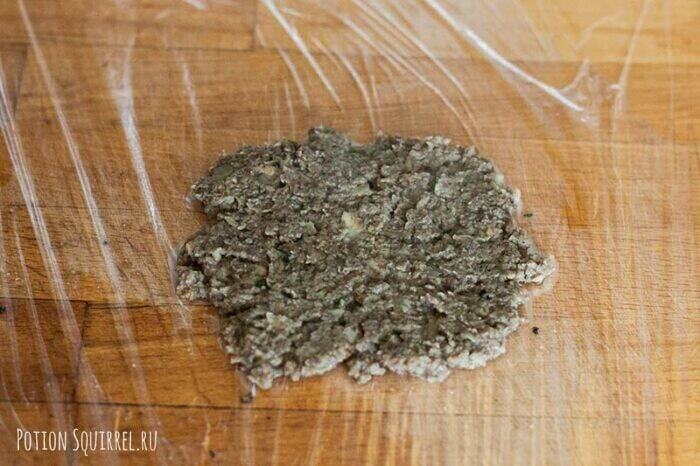 Cover with another portion of mushroom paste. 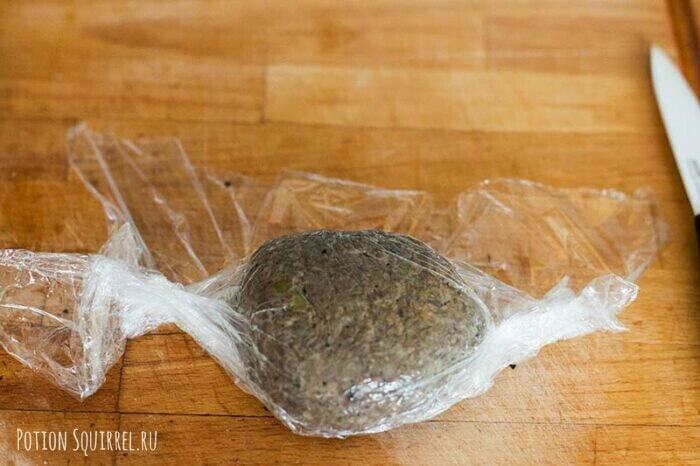 Now, using the film, you need to completely wrap the meat in the duxel, pack it in the film and put it in the refrigerator for at least 10 minutes. Repeat with all the pieces. 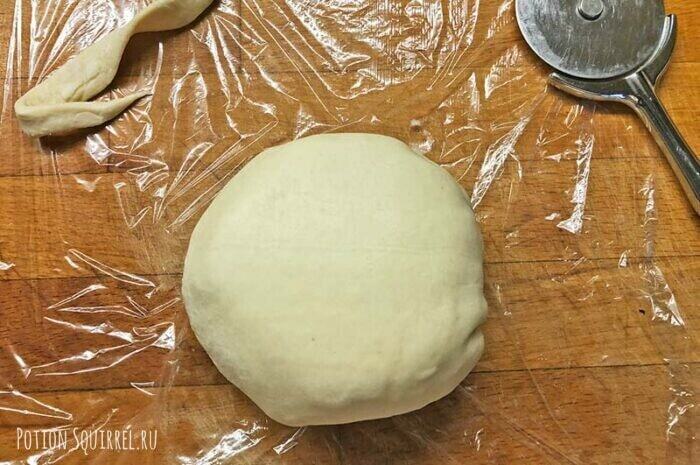 Roll out a piece of puff pastry on film. I got somewhere 15 cm on 30 cm. 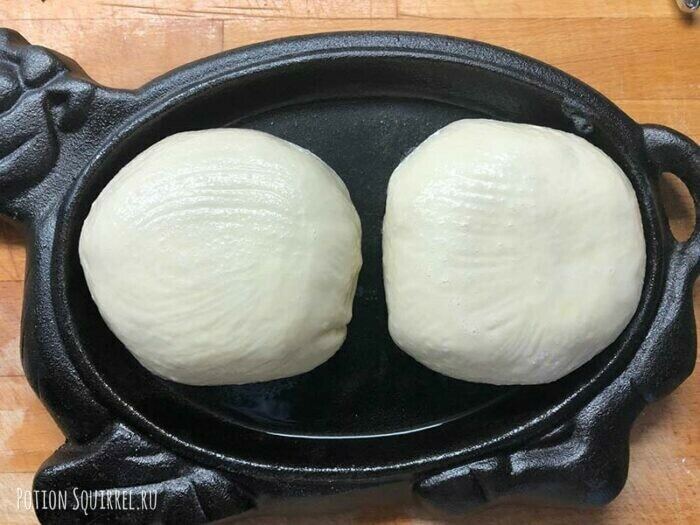 Close the meat dough. If there is too much, cut off with a pizza knife. There should be no gaps through which the juice will flow out! 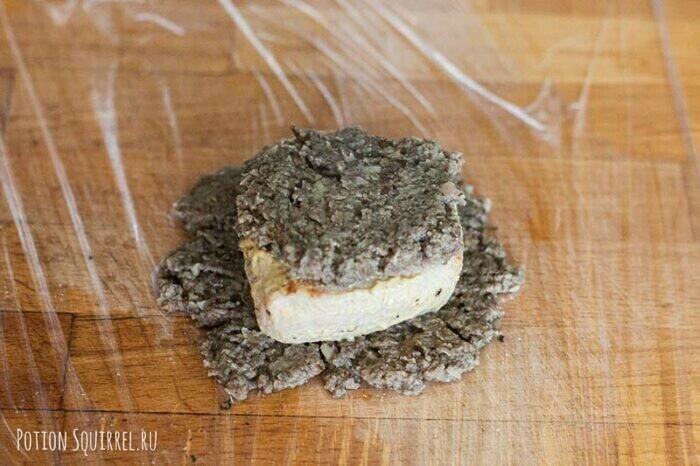 Wrap in foil and send in the fridge. Repeat with the remaining pieces. Beat egg with a pinch of salt. 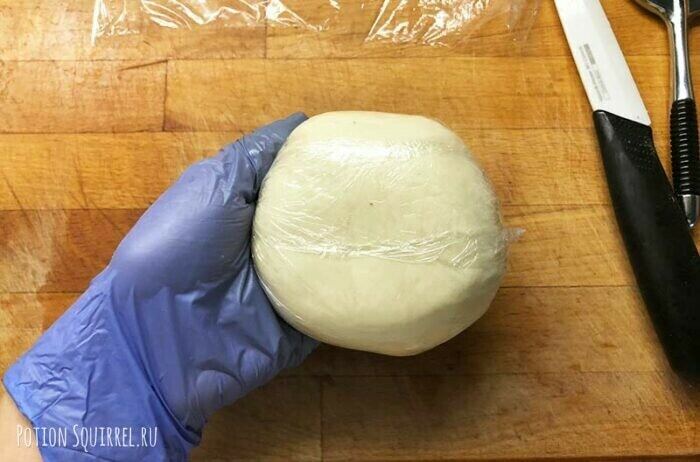 Cut the blunt side of the knife so as not to cut through the dough. 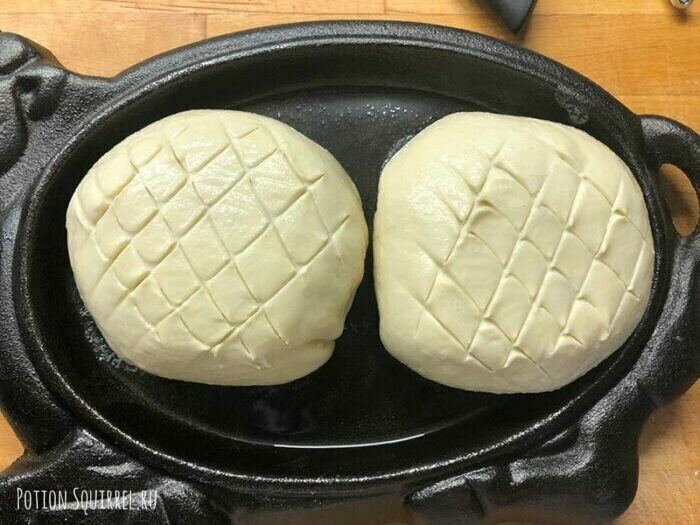 Bake from 15 - 20 minutes. 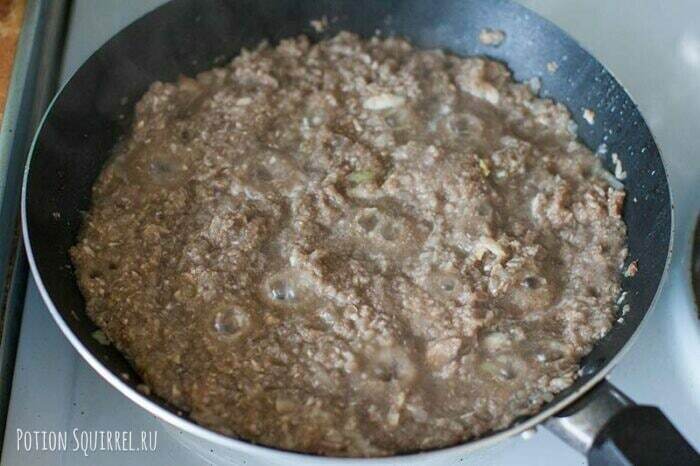 In the photo the result is 15 minutes, meat MEDIUM very juicy. 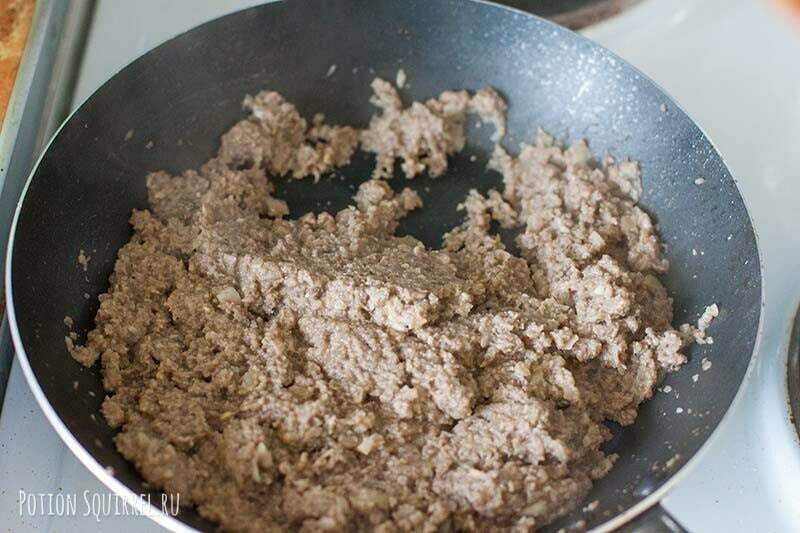 20 minutes will get meat MEDIUM WELL. 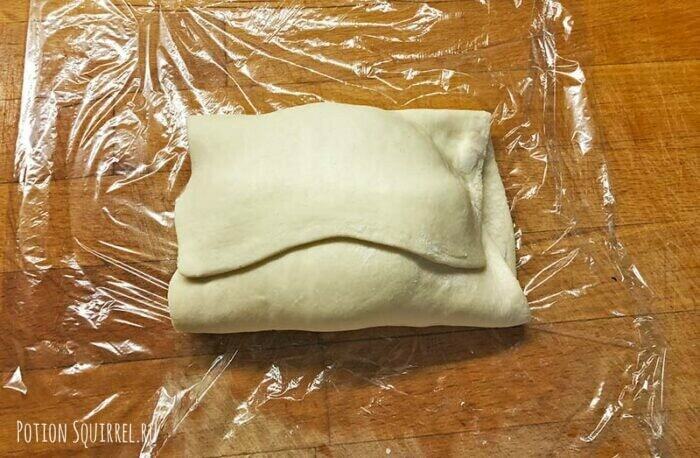 The time limit is 22 minutes, then the puff pastry will start to burn.